In a remote corner of southern Costa Rica, Osa Conservation runs a biological station that receives researchers from all over the world, as well as students and visitors who share a passion for conservation. At this station, there is a complete team working on-site: A group of scientists, naturalists and environmentalists doing our very best to apply our knowledge to make conservation possible. I am excited to have recently joined Osa Conservation as their Naturalist Guide and Avian Program Coordinator. The day I learned about Osa Conservation (OC) was in 2012, writing a monograph about the endemic Black-cheeked Ant-tanager (Habia atrimaxillaris), while I was still studying in the university. I read about the efforts OC was doing to buy lands in order to protect the habitat for the many endangered birds of the Osa Peninsula. I am a tropical biologist who graduated from National University (UNA), Costa Rica. After learning the reality of conservation biology in Costa Rica, I chose a path that I consider fundamental in the work towards conservation: coupling science with people, and understanding that the social backgrounds of communities are the lines between preserving or declining the ecosystem’s health. And this is precisely one of the basis of the organization I work for, and the main reason why I decided to join this experience in the Osa, where I work as a naturalist guide, birder and station assistant. 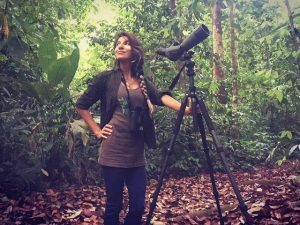 I grew up surrounded by the rainforest and the sea and I developed a passion for wildlife, which I later turned into my profession. Before graduating, I got trained as a naturalist guide and started working in a nature theme park, the place where I learned the importance of citizen science and environmental education. I have a lot to acknowledge to this place, because I was not really planning to keep working as a guide, but without it, I would have never been able to do what I am doing today. In 2014, I started doing some freelance work involving teaching people about nature and raising awareness about conservation problems. 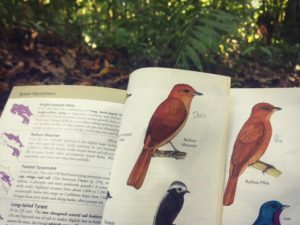 At the same time, I began birding and I settled t he first Christmas Bird Count in Golfito (a small town in the southeast region of Golfo Dulce), where I still manage and coordinate it with a close friend that works in tourism. Afterwards, I got involved in the tourism business by working in an ecolodge as a resident biologist and guest services manager, which of course was a great experience! While working there, I became acquainted with OC through collecting camera trap data of wildcats and their prey as part of their camera trap network program. We even got our work together featured in The New York Times. I really enjoy working in the Osa! It is a paradise for a biologist: hiking in the forest includes following a mixed flock of birds in the understory, finding a jaguar print, watching the spider monkeys swing through the canopy, followed by the enjoying the sunset on the beach. My job with Osa Conservation allows me to do what I love, but also share what I love with our visitors. When I am not in the field birding or collecting information on natural history, I am in charge of the details that help our station work properly. I help maintain contact with researchers and visitors before they arrive, visit near-by lodges and partners to raise awareness about the mission of our organization, and work hard to make sure that our conservation efforts reach the local communities. I am responsible for receiving people from the first moment they step into our place. 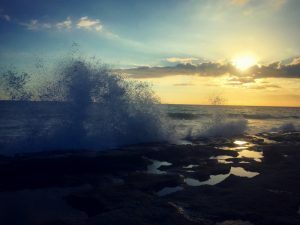 When you come to visit Osa Conservation, I will always be around to help you when needed and ask you how everything is going – Have you visited the beach to see the sunset? Did you see the Scarlet macaws along the way? Did you enjoy waking up to the howler monkeys in the morning? Or, I will invite you to go birding with me! We will make a connection here; we will shake hands to say hi and we will hug to say bye. If you have not yet been to the Osa, I encourage you to come and adventure in this mesmerizing paradise! Take a look at this link and learn more about what Osa Conservation is doing in the Osa Peninsula.